A review of Picture Perfect Lighting by Roberto Valenzuela. Post may contain affiliate links. Some of you may be wondering why I am reviewing a nonfiction book, instead of my usual fiction. In addition to being a food blogging, wine drinking, cat loving blogger, I am also a professional photographer: Pamela Greer Photography. I read this book to perfect my art and I loved it so much that I wanted to share it here. I have watched several of Roberto Valenzeula’s classes on Creative Live and I have his first book, Picture Perfect Practice. Somehow I missed his second book, Picture Perfect Posing, but it’s on it’s way to me even as I type this! Roberto never ceases to amaze me with his work ethic and his attention to detail. Those characteristics shine through in this book as he takes you step by step on how to master light. After reading the first 3 chapters, I purchased a Moleskin notebook, just for taking notes and working my way through this book. It’s that good. The book is divided into 5 parts as he guides you through The Building Blocks of Light to finally, Executing Your Lighting Vision. Part One is titled the Building Blocks of Light and covers how light works and the five key behaviors of light. Part Two is titled Circumstantial Light. He offers 10 circumstantial light elements and teaches you how to analyze each location using the 10 elements. This chapter alone was huge to me. I now look at all locations through these elements. Part Three is titled The Lighting Benchmark Test and Helper Light. A lot of good information on using reflectors. Part Four is Helper Light: Flash Techniques – where he covers the ins and outs of using flash. Everything from the difference between manual and E-TTL to using groups and channels. Part Five is Executing Your Lighting Vision. This chapter is filled with a series of case studies using different techniques to create your vision. Roberto explains everything in easy to understand language and then shows you exactly what he is talking about with clearly labeled photos. He even shows some of his early work in photography, pointing out the mistakes that he made. 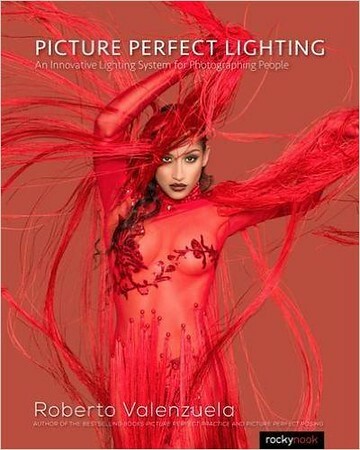 Picture Perfect Lighting is perfect for the beginner through advanced, there is something for everyone in this book. i’m sure you will get plenty of enjoyment (and maybe even a tip or 3) out of this book. I have to take Mark for his senior portrait next month; I can’t believe my baby is about to finish his junior year of high school. How did he get so old, when I think I’m still, like, 32?